Quesadillas and breakfast tacos all rolled into one giant Quesadilla Breakfast Taco! Anybody remember the double decker taco from Taco Bell?! Goodness, I remember loving those things! (Fortunately, my tasts and standards have improved since I was 7.) I remember my mom bringing my brother and I each one every summer during swim meets (go sweetwater surfers!) and God bless her for sitting through those 8 hour swim meets just to see us swim for 30 seconds. But back to tacos ... this is my grown up (and way healthier) version of the double decker taco. You can customize these any way you like... play around with different toppings, try different seasonings. This is the combo that works well for us, but the possibilities are endless! *Both H-E-B and Kroger have great store brand canned organic refried bean options. Just beans and spices in a BPA-free can! Preheat a large skillet and a medium size saute pan each over medium heat. To the side, assemble 4 quesadillas (each with 2 tortillas and 2 Tbsp shredded cheese). Add avocado oil to both the skillet and the saute pan, and let it heat for a few minutes. Place assembled quesadillas on the skillet and let cook for 5-6 minutes on each side. Add the diced potatoes to the sautee pan and stir to coat with the avocado oil. Let heat/brown for 10 minutes. Stir. Add in sausage or scrambled eggs, and heat for an additional 10 minutes. 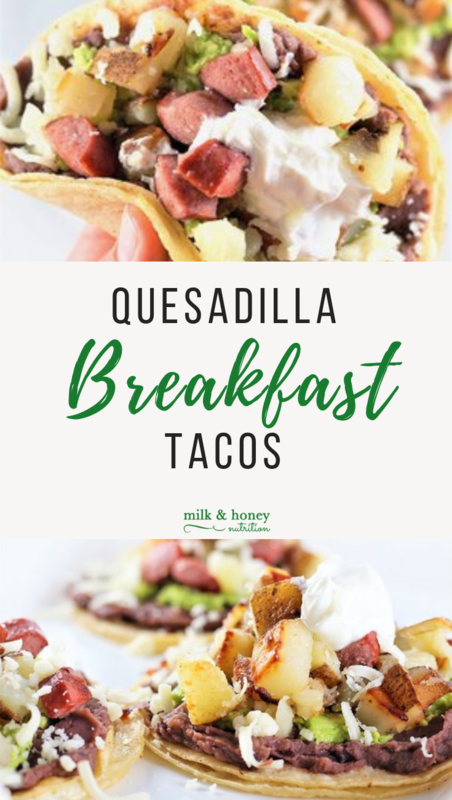 Once everything is cooked, you're ready to assemble the best Quesadilla Breakfast Tacos ever! You can do this anyway you like, but I prefer this order: refried beans, mashed/seasoned avocado, potato/sausage/egg mixture, cheese, and greek yogurt.